LAUSANNE (Switzerland) -- The World Baseball Softball Confederation announced the groups for the 2015 WBSC U18 Baseball World Cup, which will be staged from 28 August - 06 September in Osaka, Japan. 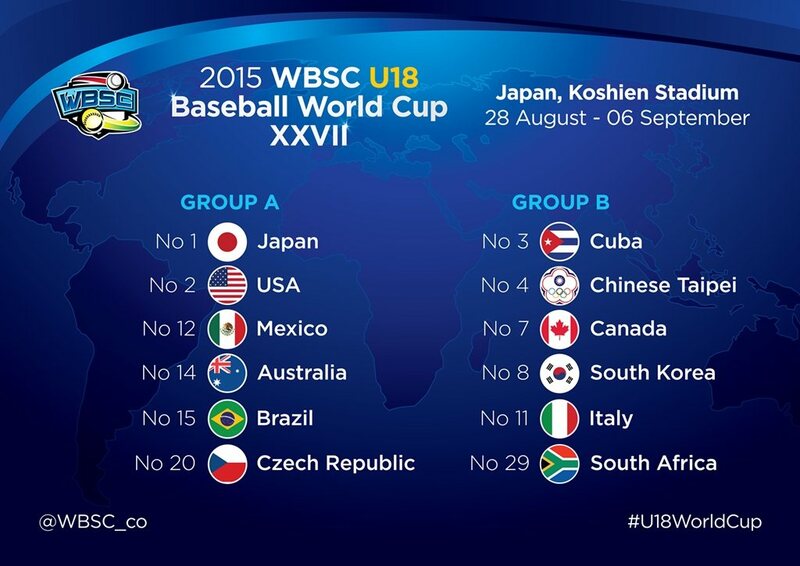 A group round robin will open action of the 2015 U18 Baseball World Cup. The top three finishers from each group will meet in the Super Round Robin, with the two nations with the best total records qualifying for the U18 World Championship finale at Japan's "Baseball Mecca", historic Koshien Stadium, which was built in 1924. Nippon Professional Baseball (NPB), a WBSC Member, is adjusting the Hanshin Tigers' home schedule at the legendary 47,000-seat Koshien Stadium to accommodate the 2015 U18 Baseball World Cup. The 2015 U18 Baseball World Cup will feature six out of the Top 10 nations in the world, and eleven out of the Top 20, setting the stage for the most competitive U18 World Cup on record. The 2015 U18 Baseball World Cup will represent a global footprint that spans across the entire western hemisphere from North-, South-, and Central America and the Caribbean -- and Africa, Asia, Europe and Oceania. The last U18 Baseball World Cup in 2013 had a potential broadcast reach of 144 million homes and potential online/mobile reach of 20 million, based on reports furnished by leading media rights agency and WBSC partner MP & Silva. "The baseball and softball world is hopeful that the young stars at the 2015 U18 Baseball World Cup in Japan, as well as other players around the world, will have the opportunity to represent their countries and our sport at the Tokyo 2020 Olympic Games. Baseball and softball have surpassed a number of historical benchmarks in recent years in terms of youth platforms, gender equality, globalisation, building National Team brands and expanding the broadcast reach of international competitions, which could potentially help serve the mission of the IOC and Olympic Movement." The World Baseball Softball family is anxiously awaiting the process to next year's IOC session just prior to the Rio 2016 Olympic Games, that will decide which new sporting events will be included at the Tokyo 2020 Games. Baseball and Softball -- top sports in Japan -- as well as other sports have been in discussions with Tokyo 2020 Games organisers and the IOC on the new process to include extra sporting events as part of the IOC's Agenda 2020 reforms. The WBSC U18 Baseball World Cup, along with its continental qualifiers, have featured some of the biggest names in the sport, such as Canada's Brett Lawrie, Japan's Yu Darvish, South Korea's Shin-soo Choo, Cuba's Yasiel Puig and Aroldis Chapman, and USA's Clayton Kershaw, Bryce Harper, Manny Machado, Buster Posey, among countless others. The most recent generation of rising stars include Cuba's Yoan Moncada, Jorge Soler, USA's Francisco Lindor, Canada's Dalton Pompey and Japan's Shohei Ohtani and Shintaro Fujinami. World No. 2 USA will be entering the U18 Baseball World Cup -- the highest competition platform that features baseball’s most elite players in this age group -- as the two-time defending U18 World Champions. In addition to the U18 Baseball World Cup, the 2015 WBSC official international calendar includes the Men's Softball World Championship and Pan American Games, both in Canada; the U12 Baseball World Cup in Tainan, Chinese Taipei; the U19 Women's Softball World Championship in Oklahoma City, USA; the inaugural Premier 12™ Pro Championship, co-hosted by Japan and Chinese Taipei; and the historic Europe vs Japan Series that took place last month at the Tokyo Dome.